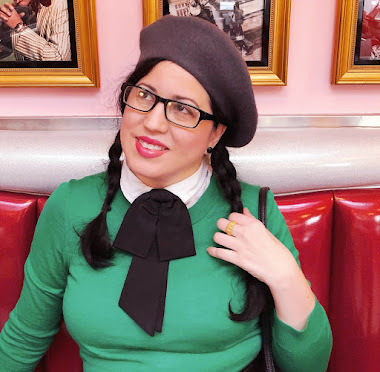 Yesterday I shared with you a wonderful book all about old fashioned soda fountains and incredibly delicious recipes that will make your sweet tooth happy for days. Today I will like to share with you my little rendition of The Sundae of Broken Dreams. Well, actually, thanks to my husband I was able to taste it and try it out. He loves putting things together more than I do, so many thanks to him! It looks a little messy but it was a really, really humid day (hello the horror of my hair! ), but in the end it was the taste that mattered. The caramel sauce, ice cream, and whipped cream created layers of sweetness which I loved. What really made it all pop in my mouth was the salted pretzel with all that sweetness, just divine. I love it so much this is going to be my "go-to" sundae when I am at home. If you want to know more about the Soda Fountain or the Brooklyn Farmacy, feel free to click on the highlighted links that I provided. That looks delicious! Random but I love your hair clips. Seriously yummy looking!!! I adore salty and sweet on the same spoon and know that this would be a big hit at our house, too. I'd be tempted to add a little chocolate sauce into the mix, too, but would first try (a GF version of) it as is. Thank you for the tasty share!